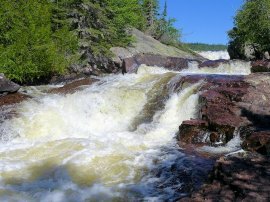 Located about 18 miles west of Thunder Bay on Hwys 11-17, Kakabeka Falls park offers modern and semi-modern camping, 6 hiking and nature trails, swimming, fishing, and its main attraction - the 138 ft high water falls. Boardwalks and wheelchair accessible trails offer several nice views of the falls. The history center has exhibits of the wildlife, fauna, and geology of the area. 90 of the 170 sites have electric hookups and there is a RV dump station. Nearby attractions include Fort William Historic Park and numerous things to see and do in Thunder Bay. 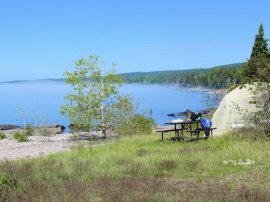 There are two municipal campgrounds in Thunder Bay: Trowbridge Falls located NE of the city on the Current River and Chippewa Park located south of city on Lake Superior. Trowbrige, while a nice location, is semi-modern and when last visited it was not well maintained. 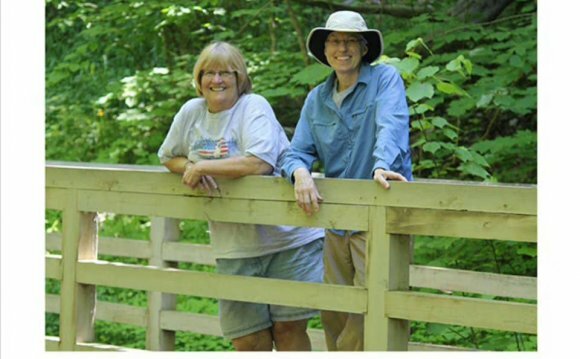 When we last visited Chippewa Park (website) it was undergoing an extensive rehabilitation that has now been completed. As it has many amenities of interest to families and several RV sites we can provisionally recommend it. In 2011, Fort William Historical Park opened up a campground adjacent to its grounds. It was closed when we visited in late September so we can't give a first-hand report except we could see the sites are on grass and are reasonably level. We've also stayed at the KOA Campground north of the city near the Terry Fox memorial visitor center. While a bit more expensive, its sites and grounds were well maintained, its washrooms and showers were modern and very clean, and its location was convenient to the Lake Superior Circle Route. If you are planning to camp in the Thunder Bay area the KOA or the Kakabeka Falls campground are our favorites. The "Giant" park occupies over 60, 000 acres of wilderness and 75% of the Sibley Peninsula which is directly across the bay from the city of Thunder Bay. In addition to extensive frontage on Lake Superior, it also hosts over 20 inland lakes. Other amenities include: 80 km of hiking trails, mountain biking, canoeing, kayaking, swimming, fishing, a nature center and a full service campground. The 20 lakes, the ghost town of Silver Islet, the number of hiking trails, and the scenery, a nature center, and other attractions makes this a good campground to spend a few days as there is much to explore here. As a stop-over on the Lake Superior Circle Tour its only disadvantage is that it is 33 km (turn on Ontario Highway 587) off the main circle route (Hwy 11-17). Located a few miles east of the village of Rossport, the Rainbow Falls Park has two widely separated campgrounds. One is on Lake Superior with a nice view of the lake and the Rossport Islands. Several nice RV sites, and a few very picturesque lakeside tent sites (see the photo at the top of this page). But if it is biting fly season, these critters especially like to congregate here. Families may prefer the upper campground on Whitesand Lake which is the headwaters for Rainbow Falls. The lake offers nice swimming, fishing, boating and canoeing. Other attractions include the picturesque falls and a few very nice hiking trails up to mountain and hilltops with panoramic views. The campground is modern, with showers, dump station, and approximately 100 campsites, 50 of which have electric service. The nearby village of Rossport is a worthwhile visit. The Aguasabon Falls Campground is located on the western edge of Terrace Bay near the falls. The campground offered full service with showers, dump station, full hookups, camp store, and canoe rentals. It is on the Casque Isle Hiking Trail and within walking distance to the Terrace Bay beach, shopping and other recreational attractions. (But in 2014 it was closed, no word if it will re-open). RV travelers may be able to boondock in the Terrace Bay beach parking lot. What are the five Great Lakes names?